Rainbows Children's Hospice is located in Loughborough and was officially opened in 1994. Rainbows’ is a children's hospice for East Midlands and South Yorkshire and provides respite, palliative and terminal care to families who have a child with a life limiting illness. The hospice receives about 6% statutory funding and is reliant on fundraising and donations. Stephen and Tracy have supported Rainbows since 2004 and the hospice is our chosen UK-based charity. To find out more about Rainbows, click here. Since 2006 the Clinical Audit Support Centre have provided support in clinical audit, quality improvement and patient safety to the hospice and this has incorporated training for staff, strategic support and help undertaking a wider variety of in-house projects. The hospice has made great strides forward in terms of their clinical audit work and the service-level agreement (SLA) we have held with the hospice over this time frame has been instrumental in this work. Click here to see how the SLA operates. Moreover, the clinical audit work undertaken by Rainbows has been presented at external events (click here for details of a simple in-house audit). In recent times, Rainbows have extended their work beyond clinical audit and now encourage staff to conduct quality improvement projects. The hospice uses significant event audit to learn from adverse incidents, click here for more details. This diverse and comprehensive approach to improving patient care recently led to the hospice being awarded an outstanding rating from the Care Quality Commission. During CASC’s visit to Gondar Hospital in Ethiopia (December 2011) we became aware of the inspirational work of the Kindu Trust. The Kindu Trust is our international charity. 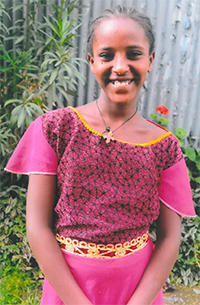 The Kindu Trust support very poor children and their families living across Ethiopia. Since 2012 CASC have sponsored Tenewerk Tesfa (pictured above with her mother) enabling her to attend school and ensuring food, shelter and fuel for her family. To find out about the Kindu Trust, click here. Join our newsletter to keep updated with all things Clinical Audit!